Innovative drugs help people enjoy longer, healthier, more productive lives. They also allow our health care systems to save money. However, the reimbursement of new drugs by Canada's public plans can face considerable delays due to a very burdensome regulatory process. Far from resolving this problem, a new reform will duplicate certain stages of this process and possibly lengthen it. This Viewpoint was prepared by Mathieu Bédard, Economist at the MEI. The MEI’s Health Policy Series aims to examine the extent to which freedom of choice and private initiative lead to improvements in the quality and efficiency of health care services for all patients. However, the reimbursement of new drugs by Canada’s public plans can face considerable delays due to a very burdensome regulatory process. Far from resolving this problem, a new reform will duplicate certain stages of this process and possibly lengthen it. Health technology assessment agencies then examine the advisability of reimbursing the drug, based on provincial governments’ ability to pay. 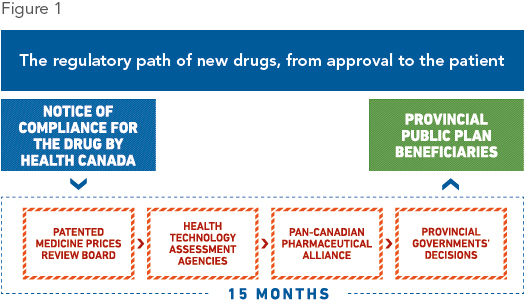 (4) Once this evaluation has been carried out, the provinces together negotiate prices with the manufacturer through the pan-Canadian Pharmaceutical Alliance (pCPA). This single stage can take several months. (5) All of these organizations deal with drug prices, each in its own way, even though none of them buys or reimburses drugs. Finally, provincial governments make use of these studies and of the result of negotiations to choose which drugs they will include on their respective lists of reimbursed drugs. By adding these new regulatory barriers and changing the countries with which it compares itself, for the explicit purpose of reducing the prices of new drugs,(11) Ottawa seems set on proving at all costs that prices in Canada are excessive, without taking into account the savings that these drugs enable within the country’s health care systems. German hospitals, for their part, establish their own lists of drugs to prescribe, from the moment they are approved. They choose drugs based on budgets that are allocated to them for each patient. (14) The German system therefore shows how regulation can leave substantial room for market-based principles, which the Canadian systems tend to replace with bureaucracy. Instead of increasing the regulatory burden and running the risk of penalizing patients, Health Canada should be looking to increase and accelerate access by taking inspiration from the best practices of other countries, namely relying on prices that result from supply and demand and authorizing the reimbursement of new drugs as soon as they’re approved. When one is sick, each passing month can seem like an eternity; such a change could give Canadians access to new drugs at least 15 months earlier. 1. Frank R. Lichtenberg, “Have Newer Cardiovascular Drugs Reduced Hospitalization? Evidence from Longitudinal Country-Level Data on 20 OECD Countries, 1995-2003,” Health Economics, Vol. 18, No. 5, 2009, pp. 519-534. 2. This process alone can take between 6 months and two years. 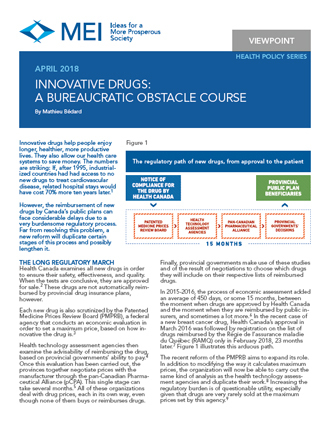 Government of Canada, How Drugs Are Reviewed in Canada; Yanick Labrie, “What Role Do the Public and Private Sectors Play in Pharmaceutical Innovation?” MEI, Economic Note, September 3, 2014. 3. Government of Canada, Patented Medicine Prices Review Board, Regulating Prices, Regulatory Process. 4. In Quebec, this is the Institut national d’excellence en santé et en services sociaux (INESSS), and the Canadian Agency for Drugs and Technologies in Health (CADTH) in the rest of Canada. Canadian Agency for Drugs and Technologies in Health, CADTH Common Drug Review (CDR); Institut national d’excellence en santé et en services sociaux, Evaluation process and criteria. 5. Don Husereau et al., “Evolution of Drug Reimbursement in Canada: The Pan-Canadian Pharmaceutical Alliance for New Drugs,” Value in Health, Vol. 17, No. 8, December 2014, pp. 888-894. 6. Innovative Medicines Canada, Access to New Medicines in Public Drug Plans: Canada and Comparable Countries - 2016 Annual Report, Figure 6, p. 21. 7. Government of Canada, Notice of Compliance search from Health Canada, Drug identification number: 02453150; RAMQ, List of Medications: Last Updated on 1 February 2018. Patients insured by public plans can also try their luck with the RAMQ’s patient exception program, or with equivalent programs in other provinces, as the case may be. RAMQ, Pharmaciens, Médicaments, Le régime public d’assurance médicaments et les mesures des médicaments d’exception et du patient d’exception. 8. Health technology assessments are hard to generalize and transfer from one agency to another. A central evaluation, applicable to all Canadians, like the one the PMPRB will carry out, will not be able to be used by the agencies that already carry out these same calculations. M.J. Sculpher et al., “Generalisability in Economic Evaluation Studies in Healthcare: A Review and Case Studies,” Health Technology Assessment, Vol. 8, No. 49, 2004, pp. 1-192; Canada Gazette, “Regulations Amending the Patented Medicines Regulations: Regulatory Impact Analysis Statement,” Vol. 151, No. 48, December 2, 2017. 9. Don Husereau et al., op. cit., endnote 5, p. 889. 10. This is the median delay, the average delay being much longer. Ali Shajarizadeh and Aidan Hollis, “Delays in the Submission of New Drugs in Canada,” Canadian Medical Association Journal, Vol. 187, No. 1, January 6, 2015, pp. E47-E51. 11. Mathieu Bédard and Patrick Déry, “Access to Medication: Preserving a Fragile Balance,” MEI, Viewpoint, November 15, 2017. 12. IGES Institute, Reimbursement of Pharmaceuticals in Germany 2018, pp. 13-14; Luc Nguyen-Kim et al., “Les politiques de prise en charge des médicaments en Allemagne, Angleterre et France,” Questions d’économie de la santé, IRDES, No. 99, October 2005, p. 3. 13. Luc Nguyen-Kim et al., ibid., p. 3. 14. These budgets are established by the authorities based on patients’ illnesses, and cover their overall care. The authorities therefore do not directly reimburse drugs, but patients’ overall care. Hospitals are free to manage these budgets as they see fit. Ecker + Ecker, Reimbursement of Innovative Pharmaceuticals and Medical Devices in Germany, 2015, p. 13; IGES Institute, op. cit., endnote 12, p. 22.